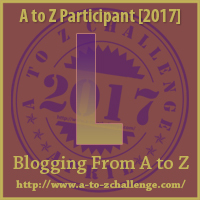 This month I’m taking part in the A-Z Challenge! Which means I’ll be writing 26 posts (on set days through the month) each one corresponding to a letter of the alphabet. Today is day 12, which means letter L.
“You still there?” Johnny said. I ended the call, cutting him off mid-sentence. I breathed out slowly, and turned to face Capinski. He raised an eyebrow. None of the shop owners or staff remembered seeing Anna. I was pretty certain she’d been in some of their shops, but dying her hair and cutting it to match the other victims seemed to be enough to fool everyone’s memory. Capinski got a text. “They found another body,” he said. I watched his expression, trying to see if he might give anything away for this new body being his kill rather than mine. He didn’t look any different than normal. “I’ll follow you,” I said, and smiled to myself that I really would be following his every move from now on. We drove out towards the forest where I’d killed and left Anna’s body, but instead of turning left towards the cabins, we drove straight for another 2 miles. I began to wonder when and where Capinski had seen me with Anna. Had he been planning to abduct her but caught me doing it instead? He’d obviously seen me leave her body in the forest, and then moved her body after I left, but did he know before then? We turned onto a dirt road that led to an area of cabins that was occupied year round. Risky, I thought to myself. For him to dump a body out here with so many potential witnesses. We both parked as close as the extra police cars would allow us – the scene was swarming with uniformed officers, crime scene techs, and the coroners van was parked further up the dirt road. “Hey Carly,” I said, as I ducked under some crime scene tape and made my way towards where I presumed the body was. “Hey,” she said, sounding puzzled. “What’s wrong?” I looked around to see where Capinski was, and noticed he was back near the coroner’s van talking to some officers. My mind started to wander – had he first seen me and Anna when he was out to dump his own body? I turned away from Carly, so she didn’t see me trying to suppress a laugh. Interesting story you have here. Good times when a character wonders if someone noticed a body dumping earlier. LOL.